SURGEON X, VOL. 1 collects the first story arc of the acclaimed medical thriller that incorporates politics and family drama seamlessly. This is John Watkiss’ last published work and also features some of his incredible charcoal development drawings. 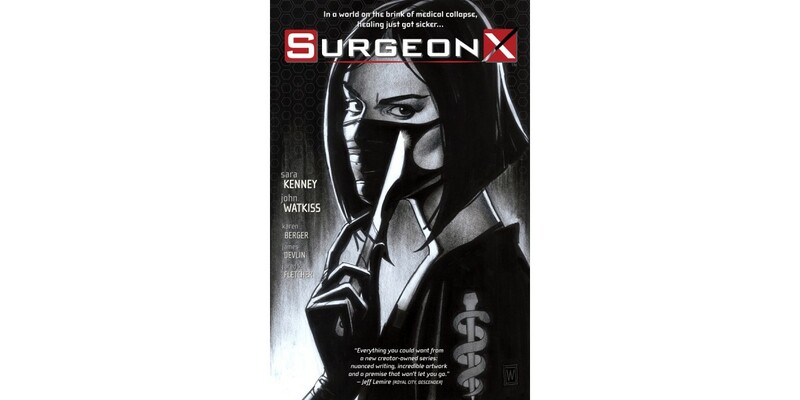 In addition to the collection is the all-new digital exclusive SURGEON X SPECIAL: Trial and Error by Sara Kenney with art and cover by Warren Pleece (Incognegro). This standalone story set in Bristol, England in 2037 introduces Sun Walker and asks the question, when someone you love is dying, how far would you go to save them? Rosa Scott helps her cousin, Sun, a chemical scientist with a risky plan that could kill or cure. Available only on comiXology and Kindle, the Trial and Error Special was funded by the Royal Society of Chemistry.